Remember Weekend at Bernie's? Did it make you laugh? Yep, there's nothing funnier than trying to convince everyone that the corpse sitting next to you and sitting out on the lounger is actually alive. And while it didn't exactly kick off a new sub-genre, it remains the touchstone for any movie wadering into such blackly comic territory. The latest, snappily titled The Two Deaths of Quincas Wateryell, is from Brazil, of all places, and was produced by none other that Walter Salles – yes, he of Central Station and The Motorcycle Diaries – and directed by Sérgio Machado, the man behind internationally acclaimed Lower City, and writer of Salles' Behind the Sun. 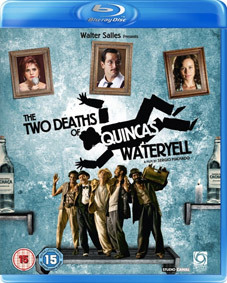 The Two Deaths of Quincas Wateryell will be released on UK DVD and Blu-ray by Optimum Home Entertainment on 1st August 2011 at the RRP of £17.99 for the DVD and £19.99 for the Blu-ray.